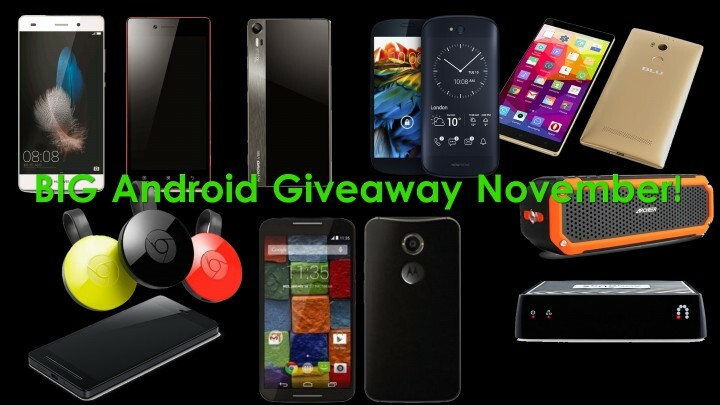 For this month’s giveaway, we have 7 total YouTubers putting in prizes each. First, we have Flossy Carter, who makes awesome raw reviews of gadgets from New York giving out Blu Pure XL smartphone. Second, we have Ash from C4ETech, who also makes awesome reviews of tech from India, giving out Lenovo Vibe Shot. Third, we have our Danny Winget who calls himself the asian Flossy Carter giving out Smartisan T1 Android smartphone. Fourth, we have BooredAtWork who does a ton of tech and headphone reviews giving out a 2014 Moto X 2nd gen.
Fifth, we have Justin Tse who does awesome Android and iHOs reviews giving away 2 Chromecasts, SlingBox M1, and Archeer 10W speaker. Sixth, we have Shane from DroidModderX who is the root master giving away Huawei P8 Lite. Finally, I am giving away my Yota Phone 2, which I’ve barely used a few days, it’s pretty much brand new. That’s a total of 10 prizes you can win thanks to everyone involved. To enter the contest, it’s really simple, just subscribe to all the YouTubers involved using the gleam.io link provided in the description. You can get extra entries through Twitter and sharing to your friends and family. Good luck guys and don’t forget to enter as you have nothing to lose! Next story Nexus 6P Review! Previous story How to Do Long Exposure Photography w/ Android Smartphone & ND Filters!